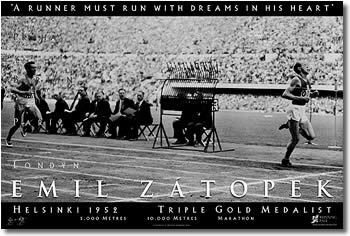 Emil Zatopek - "Triple Gold"
In 1952 Emil Zatopek achieved the impossible. At the Helsinki Olympic Games he won the 5,000 meters, the 10,000 meters and the Marathon, setting an Olympic record in each event. Never before or since has an athlete approached his epic performance! The "Czech Locomotive" is shown here winning gold in the 5,000 meter Olympic Final. Emil taught the world the modern way to train, running endless laps at top speed, and how to race, driven by an overwhelming willpower. This poster has been produced in partnership with Emil's wife Dana, and with the invaluable assistance of Emil's former teammate, Larry Koran. Two aspects of this poster lend a personal touch. Imprinted in the poster along the left are names of places where Emil raced to victory, presented in their Czech spellings. In the lower left you will find a copy of the famous sketch by Emil of his wife pursuing him with her javelin! Dana won the Olympic gold medal in the javelin in 1952. As you can imagine, we are very proud to bring you this tribute to a great athlete. This poster was designed and printed in the USA. View Emil Zatopek's Greatest race!